Fortress REIT Limited, the diversified property group, is preparing to welcome Makro as the first tenant in its 28 hectare Cornubia Ridge Logistics Park, which is strategically located close to Durban's thriving business and residential hub of Umhlanga as well as King Shaka International Airport and the Dube TradePort. 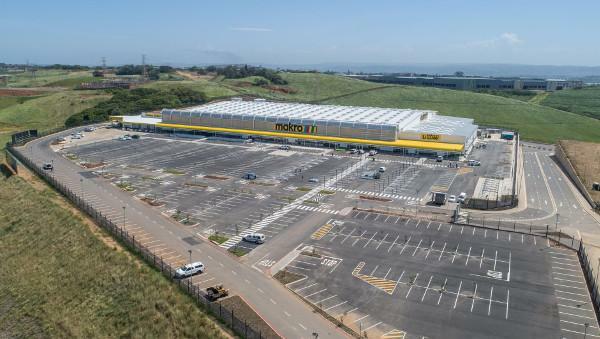 Makro's 22nd store in South Africa opens this March and will be housed in a state-of-the-art 19 000m2 retail facility within the Cornubia Ridge Logistics Park, which is adjacent to the Gateway precinct and accessible from all major highways including the M41 and the N2. The R1bn development is a joint venture between Fortress and M&F Giuricich Developments, one of the largest privately owned development companies in South Africa. "The Cornubia Ridge Logistics Park is ideally located on the main routes between Durban and the fast-growing Durban North region and is also in close proximity to the Dube Trade port, which has been designated a special economic zone, as well as King Shaka airport," said Konrad Kohler, the Development Manager at Fortress. "It has great visibility and access to the N2 and all its major feeder roads and the already functioning greater Gateway development." Construction on the Makro building, the first to be developed at the new Cornubia Ridge Logistics Park, commenced in April 2018 and completed in December. The land on which the Cornubia multi-use development is situated was purchased from Tongaat-Hulett by Fortress and M&F Giuricich Developments in 2016. More than 1.2 million cubic meters of soil was moved in order to prepare the three building platforms located on the split-level precinct. Fortress also plans to build another 23,000m2 speculative warehouse on the Cornubia Ridge Logistics Park's second platform with construction likely to commence in the first quarter of 2019. That would leave a further 18,000m2 of available big box warehouse space, which could potentially also accommodate a retail component should the need arise. These remaining warehouse developments will boast super-flat, armour-joined FM2 flooring with a 12-ton point load, which provides a sufficiently level surface to accommodate racking that can extend to just below the building's eaves height of 15 meters. "The location of the Cornubia Logistics Park allowed us to offer tenants a fully customisable logistics solution for the quick distribution of products along all the surrounding key nodes," said Kohler. The development of the Cornubia Ridge Logistics Park forms part of a deliberate strategy by Fortress to expand its logistics-focussed asset base to approximately two thirds of its total portfolio by 2020. This rebalancing process is aimed at capitalising on where it sees greater growth opportunities in the foreseeable future. "Although the domestic economy still faces some strong headwinds we remain cautiously optimistic about the logistics sector," said Kohler. "There is certainly space for further growth because even in a fairly stagnant economy there is still need for distribution of products." The Johannesburg-based REIT currently owns 100 logistics-focussed properties, comprising about 42% of its total portfolio. The remainder includes retail (35%), industrial (13%) and office (10%) properties. Its post-2020 ambition is to have an overall portfolio mix comprising two-thirds logistics and one-third commuter-focussed, rural retail properties. For enquiries for Cornubia contact Graham Marder 082 652 2236.